As you may have guessed, we were on vacation for a while. My mom came up for a visit this past week. We took her up to the cabin for long weekend. Funny, but she has not been up there during the summer in all the time we have owned it. Last Friday, the weather was naturally rainy so our plans to spend the day at the beach were scrapped. Kevin and I decided to take my mom for some antique shopping in Crystal Falls and some shopping in Iron River, Michigan. After doing the antique shopping, we decided to stop for a late lunch. Rather than the usual spots, we opted for a new place based on a billboard we saw. The Depot Restaurant is located on north 4th Street in Iron River. As you can see by the photos, the restaurant is a converted rail car. Not knowing what to expect, we walked in a bit apprehensive. At 2:00 p.m., the restaurant was empty. However, after we did enter, we were quite surprised. Dark mahogany walls and stained glass lighting adorned the place. The menu at The Depot is a bit limited for lunch offering only appetizers, sandwiches, and hamburgers. We ordered a sampler platter of appetizers. The plate came with stuffed potato skins, deep-fried mini-tacos, and some of best chicken wings I have ever eaten. These wings were not swimming in sauce but the vinegar/hot sauce was infused into the light breading mix prior deep frying. The tender, juicy wings were served with a blue cheese dip. Once the appetizers were done, out came our burgers. My burger was THE best burger I have ever eaten! The burger had grilled onions, sauteed mushrooms with a slice of muenster cheese on a hard roll. The burger was so juicy that it dripped down your hand. But, it wasn't a greasy drip down your arm. I know my description can not do any justice to this burger. All I can say is that we WILL be going back to this restaurant even if it is an hour away! If you ever get to Iron River, Michigan, I would HIGHLY recommend a visit! Have you ever purchased store-bought, frozen French fries, steak fries, or home fries? Most of the time when you make them they either do not turn a nice golden color, leaving them a soft mush, or they turn out so crispy they are more like chips than fries. Some time ago, I found a recipe that claimed to be no-fail roasted steak fries. Well, when you say no-fail to me, those will be the first recipes I try. I can not remember where I learned of this technique, but it is simple and it is no-fail. Remember the technique is key! 1. Preheat oven to 500 degrees. Place rack in lower third of the oven. 2. Cut potatoes in half length-wise. Cut the halves in half length-wise. Then, with each quarter of the potato, cut it into three wedges length-wise. With each potato you will yield 12 wedges. You must cut them into 12 wedges. This will give you the thickness you will need to cook evenly. 3. Lay all wedges on baking sheet lined with foil. Toss with olive oil to generously coat. Sprinkle the rosemary over the top of the potato wedges. 4. Roast for 20 minutes without opening oven. The top side should start to turn golden. After 20 minutes, remove sheet and flip the wedges over. Place back in oven and continue to roast for another 20 minutes or until golden brown. 5. When they come out of oven, sprinkle generously with kosher salt and toss. Serve immediately. My good friend Karin once asked to me to post a blog entry about all the different kinds of salts and how one should use them. So, Karin -- this one is for you! 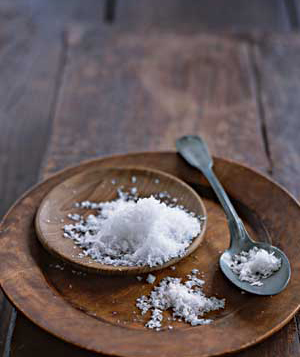 Knowing the difference between all the different types of salt can make a world of difference in your dishes. Here, six easy-to-find varieties, with tips on when and where to use them. Use it for: All cooking. Kosher salt dissolves fast, and its flavor disperses quickly, so chefs recommend tossing it on everything from pork roast to popcorn. Origin: Either the sea or the earth. Widely sold brands include Morton and Diamond Crystal, which are made using different methods. Kosher salt got its name because its craggy crystals make it perfect for curing meat―a step in the koshering process. Texture: Coarse. Cooks prize crystals like these; their roughness makes it easy to pinch a perfect amount. To buy: Look in your local supermarket. Kosher salts cost about $1 a pound. If you don't mind a few clumps, buy Diamond Crystal; it has no anticaking agents, which can leave a chemical aftertaste. Origin: Coasts from Portugal to Maine, California to the Pacific Rim. Texture: Fine or coarse. The size of the irregular crystals affects how fast the salt dissolves. It varies in color, depending on the minerals it contains (iron-rich red clay, for example, gives Hawaiian sea salt a pinkish hue). These natural impurities can add subtly briny, sweet, or even bitter flavors to the salts. To buy: Check gourmet shops or on-line. Expect to pay $2 to $15 or more a pound. Many markets sell La Baleine, a relatively inexpensive brand ($3 for 26.5 ounces). Use it for: Bringing a complex flavor to steamed vegetables or shellfish. Take a pinch, crush the crystals between your fingertips, and let them fall on freshly cooked food. This salt will add a hint of briny flavor. Origin: England's Essex coast is where the most popular brand, Maldon, is harvested. Texture: Soft, sheer, pyramid-like flakes. This is the fastest-dissolving of all of the salt grains. To buy: Search specialty-food stores and the Internet. You'll pay $6 for 8.5 ounce. Origin: Coastal salt ponds in France. The caviar of sea salt, fleur de sel is hand harvested. Conditions have to be just right (lots of sun and wind) for it to "bloom" like a flower on the surface of the water. Texture: Crystalline, which means that fleur de sel melts slowly in the mouth. Its earthy, pleasing flavor lingers on the tongue. To buy: Search specialty-food stores and the Internet (try chefshop.com). From $11 for 4.4 ounces to $45 for 35 ounces. Use it for: Making ice cream and deicing. Rock salt is paired with ice in old-fashioned hand-cranked ice cream makers to regulate the temperature. You can also use it to deice your sidewalks and driveway in the winter months. Origin: Mined from deposits in the earth, rock salt is not sold for use directly on food. It's usually packaged in an organic, unprocessed form. Texture: Large, chunky, nonuniform crystals. Minerals and other harmless impurities can give it a grayish color. To buy: It's sold in supermarkets and hardware and home stores for less than $1 a pound. Use it for: Brining pickles and sauerkraut. It will also brine a turkey, but beware: Pickling salt is far more concentrated than the more commonly used kosher salt, so you'll need to use less. Origin: Like table salt, pickling salt may come from the earth or the sea. But unlike table salt, it isn't fortified with iodine (a nutritional need for humans) and doesn't contain anticaking chemicals, both of which would turn pickles an unappetizing color. Virtually 100 percent sodium chloride, it's the purest of salts. Texture: This variety is fine grained, like table salt. To buy: Many supermarkets sell it in large boxes or bags, but it can be hard to find in cities. It costs less than $1 a pound. We had a full colander of raspberries and needed to find a recipe to use them up. I logged into food.com, which was formerly recipezaar.com and found this recipe for a raspberry crisp. The only modification I made was the amount of white sugar added to the berry mixture. The berries were just a bit on the tart side. 1. Crush 1 cup of berries and add enough water to make 1 cup. 2. In a saucepan, mix sugar and cornstarch, stir into raspberry mixture. 3. Bring to boil; and stir for 2 minutes. 4. Remove from heat; stir in berries. 6. In bowl combine oats, flour, brown sugar and baking soda. 7. Cut in butter to make crumbs. 8. Press half into a greased 9x9-inch baking pan. 10. Sprinkle with rest of crumbs. 11. Bake at 350 degrees for 20-25 minutes. During the summer, Kevin's dad was known for one thing. I think I can safely guess that each of his children will agree with me on this one. His dad had blush raspberry plants that were many years old. He was so proud of these berries. Each summer, he would deliver bags of these sweet berries. Before his dad passed, we were lucky enough to receive a few of the shoots. We planted these spindly, small plants in hopes that they would grow. The first year, we got a berry or two. The second year, a few more. By the third year, we started to yield results worthy of more than just popping them in our mouths after they were picked. Now, many years later we are harvesting the best tasting berries which we are able to make jam and freeze for later in the year. Yesterday, I finished the first of several batches of jam. This recipe yields about 8 pints of jam. 1. Clean and wash berries and add 1 cup water. Heat to boiling to break down pulp; the procedure may be aided by using a masher. Strain raspberries through colander to remove seeds. Removal of seeds not required for strawberries. 2. Place measured 6 cups of pulp in kettle and add pectin (and lemon juice, in case of strawberries). 3. Place on burner at medium-high and add sugar while stirring. Time accurately for 4 minutes. Foaming may be reduced by addition of 1 teaspoon of butter, butter or oil. Remove from burner and fill jars. Process in a water bath for 10 minutes. Will need 8 pint-sized jars, sterilized in advance. Seal with 2 pc. lids. Risotto has always been one of my favorite sides. Most people look at the ingredient list or see how long the process takes and shy away from the recipe. Most risottos contain few ingredients. While it normally takes anywhere between 20-30 minutes to complete, it really doesn't take that long while you are cooking the remainder of your meal. Just remember to get the risotto going first. 1. Bring stock to a boil in a medium saucepan. Remove from heat. 2. Heat oil in a medium saucepan over medium heat. Add onion, and cook until translucent, 5 to 6 minutes. Add rice, and stir to coat with oil. Add wine, and cook, stirring frequently, until wine has been completely absorbed, about 2 minutes. 3. Add ½ cup of the hot stock, and cook, stirring constantly, until the stock has been completely absorbed and wooden spoon drawn through rice leaves a trail. Continue stirring and adding stock, ½ cup at a time, waiting for each addition to be absorbed before adding the next, until you’ve added all but ¼ cup of the stock. Rice will be just cooked through and still slightly firm in center. It should take 20 to 25 minutes. 4. Stir in the peas, and cook until they are warmed through and risotto is creamy, about 5 minutes. 5. Remove from heat. Stir in cheese, parsley, dill, oregano, lemon zest and juice, butter, and remaining ¼ cup stock. Season with pepper. Sprinkle with cheese, and garnish with dill sprigs. One of my favorite types of cookbooks happens to be the ones churches/organizations put out for fundraisers. These contain a vast array of recipes that have been in families for, sometimes, generations. I purchased one of these from the Crivitz Area Women's Club from Crivitz, WI. Every recipe I have made out of the book has been a winner! We spent the weekend at the cabin and enjoyed one of the best weekends, so far, this summer. The weather was perfect. Low 80's during the day and low 60's during the evenings. On Saturday we went to beach for the day. Before we left, I made this Cinnamon Coffee Cake for breakfast with eggs and bacon. 1. Sift flour, baking powder, sugar. Blend in egg white, oil, milk and stir until flour is moistened. Batter will be thick. 1. Mix all topping ingredients and spread 1/2 of batter in an oiled 8-inch baking pan. Sprinkle 1/2 of the topping, add the rest of batter. Sprinkle the rest of topping. Bake at 375 for 30 minutes or until done. Hint: To spread the batter, I used a piece of plastic wrap sprayed with cooking spray. Fourth of July is the pinnacle for barbecuing. So many people around the country bring the grill out and will check the propane or charcoal, invite friends and family over, and put out a spread that could feed any army. I can remember growing up as a kid in a small south suburban town near Chicago. It seemed like each weekend we were entertaining someone for a barbecue in the back yard. Both sets of grandparents, my aunt Meenor, and other friends and family would come. Normally, my dad would fire up the old red weber and make either chicken, ribs, or if it was a special occasion, a beef tenderloin. Fourth of July was always a must regarding barbecues. Each of the neighbors would be making food, at what seemed like the same time, causing huge billowing clouds of delicious smelling smoke to pool above the four yards. The guys would all talk over the fences with their beers while the kids would be running or swimming until dinner. One of the old standbys made for each of the barbecues was the potato, onion and pepper foil packs. With its buttery sauce, charred edges of the potatoes and tasty red peppers. Nothing could be simpler to make. To this day each time I make this dish, it brings back so many good memories of my childhood. I am sure many of you have made some variation of this at some point in time, but I thought I would post the recipe for those that have not. My dad and his girlfriend came over this weekend for a barbecue and I thought I would make this for him. 1. Cut an 24-inch length of heavy duty foil. Scatter the peppers, onion, and potatoes on the foil. Add spices and butter. 2. Cut a second sheet of 24inch foil and place over the top of the first sheet. Fold each edge over at least 3 times until all edges have been sealed. 3. Heat grill to medium-high and place foil packet on the grate. Cover the grill and cook for a total of 30-45 minutes or until potatoes are tender. Flip the packet every 10 minutes. You can tell if the potatoes are done by carefully pushing on the foil packet to see if the potatoes are soft. A few summers ago, we invited our good friend Linda over for a 4th of July barbecue. The story begins with a combination of 90 degree heat and a bottle of Malibu rum. I am guessing you know exactly where this is going. You may be thinking 'oh no, not another drinking story.' Well, I assure you that this story is about food. On the menu, was a beer can chicken, some form of veggie, potato and our friend Linda's Texas Caviar. As the afternoon progressed and the chicken cooked on the grill, we indulged in some summertime libations. Let me put it this way...I was VERY thirsty that day. As Kevin and Linda were deep in conversation, I was focusing my attention on this terrific relish/dip. When they took a breather from discussing the crisis' of the world, they came over for some of the 'caviar.' As it turned out, I was busy polishing off 3/4 of the bowl. Oops! As is always the case, the afternoon was full of laughter and fun. From what I remember of dinner, once the beer can came out of the chicken, Mr. Chicken decided he would do a dance number across the counter. Picture Tom Cruise in Risky Business! The evening ended in a glorious fireworks display over one of our great local lakes. At least that is what they told me happened. I was very tired and decided to nap during the fireworks! Thanks Linda, for this latest batch! I wish everyone a very safe and happy Independence Day! 1. Mix dressing ingredients - last 6 and heat till sugar dissolves. Cool to room temperature. 2. 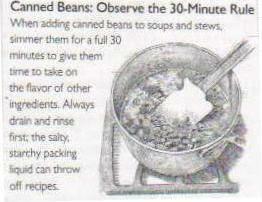 Pour dressing over bean mixture. Marinate at least 2 hours or overnight. 3. Before serving, drain and serve with Frito Scoop chips. Marinate in refrigerator.